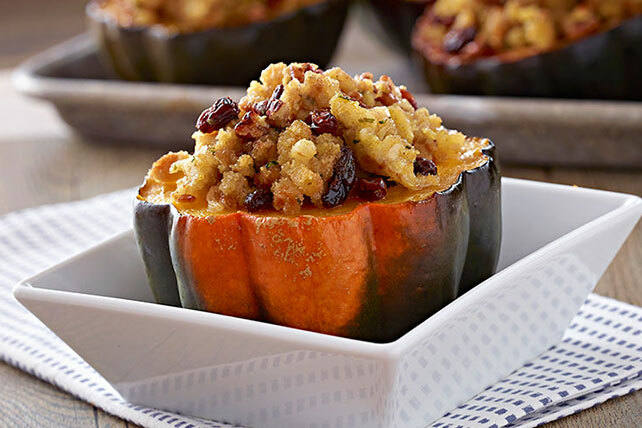 Perk up your menu with our Baked Squash with Pecan Stuffing. This baked squash recipe consists of acorn squash halves and a pecan and raisin stuffing. Place squash, cut sides down, on foil-covered rimmed baking sheet; cover. Bake 30 min. Meanwhile, prepare stuffing as directed on package, decreasing spread to 3 Tbsp. Add nuts and raisins; mix lightly. Turn squash over; spoon stuffing mixture into squash halves. Mix butter and sugar until blended; drizzle over squash. Cover. Bake 30 min. or until squash is tender, uncovering after 20 min. Serve this autumn side dish with your favorite lean meat and a crisp mixed green salad. Acorn squash is a winter squash which should be relatively heavy with a tough rind.